Type: Necklace. Great accessory and decoration for your daily and formal dress. Cross Size:2.7cm. Size:Length: First layer: 28 6cm, Second layer:36 6cm, Third layer:45 6cm. Circle Size:1.6cm. It's a perfect accessory, also a good gift to your friends It will make you beautiful on picture. (Size:Chain Length:approx.28 7cm. Prefect for daily use and easy to take off or wear. Hope you can understand. ,Austria.). Quantity: 1Pcs. Or replace item for you. 6pcs Curb Chain Necklace. Jewelry and Watches. - Chain loop size: Approx. 4 x 3 mm, Lobster clasp size: Approx. - Color: Gold plated. - Great supplies for charms pendant chains necklace Do It Yourself project. Product Type: xl00944a. Material:Ribbon,Zinc Alloy. The length and size suit for most people. It's a perfect accessory, also a good gift to your friends. Note: Due to the light and screen difference, the item's color may be slightly different from the pictures. 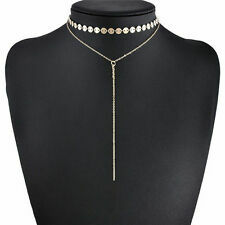 Women Chain Pearl Bib Choker Pendant Charm Statement Necklace 3 Layers Jewelry. Chunky Silver Tone Oversized Lightweight Rope Chain Big Necklace 28"
Chunky appearance, but lightweight. Rope style links. What a fabulous chain necklace! Jewelry Type: Chain Necklace. Oversized chain. Silver tone finish. Color: Silver. Hot Air Balloon Pendant Gold Tone Fashion Jewelry Necklace. Pink Green White Color Hot air Balloon with crystal stones. pendant is 1 1/2" long. Chain Length: 32" 3" extender.